Photographing lighthouses can be vastly rewarding but it is not without challenges. First of all lighthouses can sometimes be rather hard to find. They are often out of the way along roads that are not very well marked. Some lighthouses are only accessible by water so taking a boat is the best way to get the photographs. Other lighthouses may be inland but are surrounded by houses and power lines, making it hard to get just the right photo. Despite these challenges, I love photographing lighthouses. In the past 4 years I have photographed nearly 40 lighthouses and my plans are to add a few more to my collection this year. On my Squidoo page, Lighthouse Photography I talk about some of my favorite lighthouse photos and why I chose the angle and lighting for each particular shot. 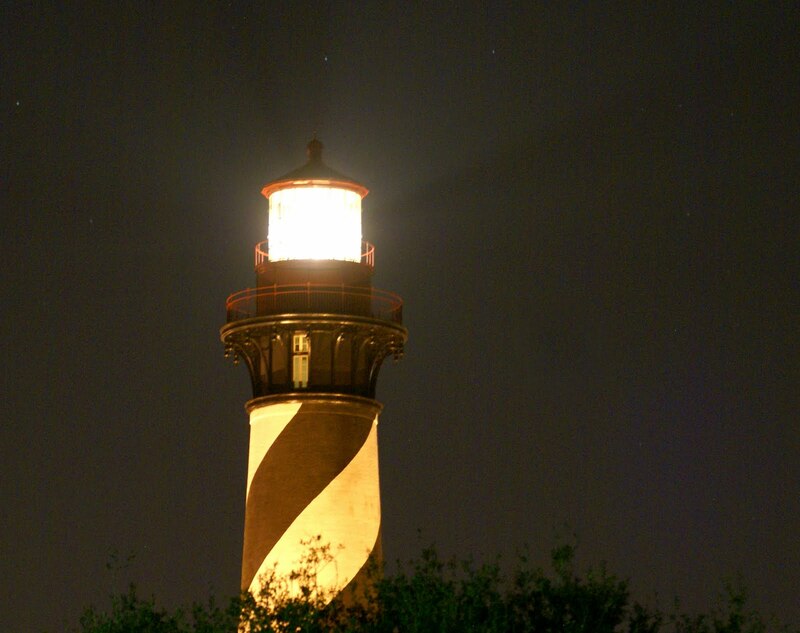 In this photo of St. Augustine Lighthouse, I took my tripod to capture the image at night. The lighthouse is surrounded by buildings and trees, so I went to a nearby park and found an angle where I could get a closeup of the light with beam shining into the night.